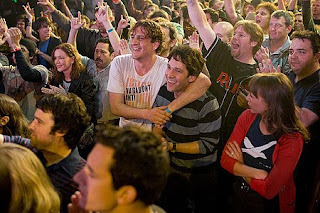 Cam's Cinematic Episodes: Film Review - I LOVE YOU, MAN: Worth Hangin' Out With. 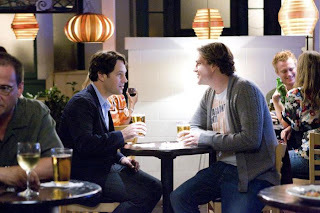 Film Review - I LOVE YOU, MAN: Worth Hangin' Out With. 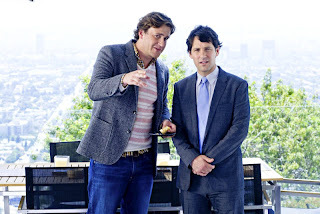 But enough about me already, I Love You, Man features everybody’s favourite non-threateni ngly handsome leading man Mr. Rudd as Peter Klaven, a slightly up-tight Californian real estate agent. Well-liked and amiable, Peter’s low-key demeanour may have hooked him a gorgeous, thoughtful fiancé in the endearingly named Zooey (The Office star Rashida Jones), but it’s also led to a so-so professional life (he’s struggling to find a buyer for Lou “The Incredible Hulk” Ferrigno’s posh residence) and a dearth of male BFFs. After an epiphany-inducing dinner with his quirky parents (former Conehead Jane Curtin and Spider-Man’s J.K. Simmons) and popular gay brother Robbie (SNL favourite Andy Samberg) our prissy protagonist dedicates himself to finding a new man-friend and, fingers crossed, a best man. After a truly catastrophic collection of hideously uncomfortable man-dates, with characters ranging fro m a banshee-voiced soccer fanatic to an eighty-five year old chess enthusiast, Peter inadvertently winds up being introduced to a prospective pal, named Syndey Fife, at an open house for the Ferrigno estate. Played by Forgetting Sarah Marshall’s Jason Segel, Syndey is a slovenly genial giant of a man-child, obsessed with Mexican food, masturbation and the rock band Rush. Despite a disturbing early number of accidental social faux pa’s by Peter, the duo quickly grows inseparable, much to the increasing concern of patient bride-to-be Zooey. As the wedding plans slowly begin to spiral out of control, and his new friendship is put to the ultimate test, Peter is forced to find a balance between his two quickly colliding universes. While I Love You, Man won’t win any trophies for originality - other than a potential MTV Movie Awards moon-man, that is – the film is ultimately carried on the shou lders of its two attractively charismatic leads. The always winning Rudd, whose previous starring vehicle Role Models was an unexpected comedic winner, continues to demonstrate his brilliant affinity for white male neuroticism, making simple public acts, such as leaving a voice-mail for a potential pal or coming up with a cool nick-name, into mini masterpieces of anxiety-soaked embarrassment. He may not have the over-the-top magnetism of a Ben Stiller or Will Ferrell but, for my money, Rudd is probably the most consistently stellar actor working in comedy today. 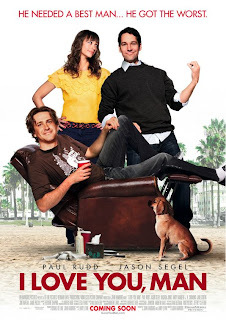 Fortunately he finds a great match in Jason Segel, who impressed with Sarah Marshall, but really comes into his own he re. His Sydney walks a fine line between shaggy lovability and unbearable neediness, but Segel never wavers, displaying not only a sharp capacity for comic timing, but also a stunning level of emotional truth and heart-warming sincerity. Syndey is a truly original creation and deserves mention among classic funny-film foils such as John Candy in Planes, Trains and Automobiles and Walter Mattheu in The Odd Couple. Further, based on the actor’s work here, I would not be surprised to one day see him making the jump to a booming career in dramatic character work. Director John Hamburg, who helmed the semi-decent Along Came Polly, does his best Judd Apatow impersonation in presenting this modern day dude-love story, with fairly robust results. The laughs, while rarely uproarious, are consistent and clever. Any movie that features references to Chocolat, Andre the Giant and former Egyptian leader Anwar Sadat is all right by me. However, I Love You, Man falters significantly, unlike the Apatow oeuvre, in regards to its astronomically gifted supporting cast. While Rashida Jones is uniformly strong, making Zooey a surprisingly plausible three-dimensional love interest, and John Favreau and Jaime Pressly kill as a dysfunctional couple in the Who’s Afraid of Virginia Woolf? mould, the majority of the team players are forced to battle it out for pretty meagre scraps. Why cast J.K. Simmons and Jane Curtin as a married couple and then ignore them? An odd and unfortunate choice, indeed. In spite of some regrettable creative decisions though, I’m not for a second going to dissuade you from checking out this predominantly successful feel-good trip into the juvenile heart of male camaraderie. I suspect that men will find I Love, You, Man frighteningly relatable and entertaining, while female audience members are almost guaranteed to laugh, when not nodding knowingly to one another. Love may be too strong a word, but I have no problem saying that I really, really liked this Man.